Carry longer lenses with greater comfort thanks to the made the USA, black Lens Support Adapter from OP/TECH USA. The strap adapter is designed to help stabilize and support lenses up to 6" in diameter and is adjustable from 11-16.5". The adapters clamp to seams on a backpack or photo vest and then the circular section goes around the front of a long lens. It will also work with many OP/TECH straps. 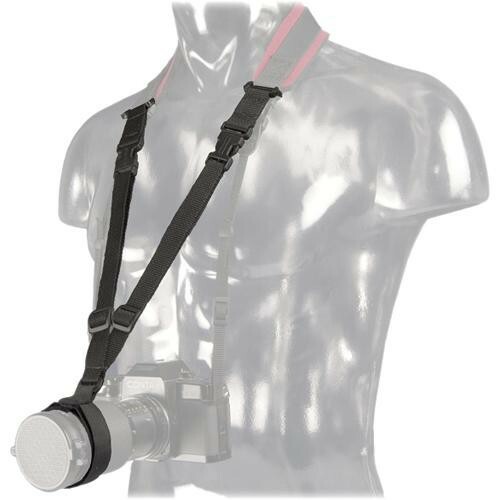 It has a quick disconnect that leaves the clamps in place and the straps on the lens. Box Dimensions (LxWxH) 3.0 x 3.0 x 1.5"
Lens Support Adapter (Black) is rated 1.0 out of 5 by 1. Rated 1 out of 5 by Trish from Don't care for this product This is a difficult product to use the only good thing about it is that I didn't waste much money on it.